Eco-friendly Bamboo Wireless Keyboard and Wireless Optical Mouse | TonerGreen - Eco-Friendly Toners from the U.S.
TonerGreen - Earth-friendly printer ink and toner cartridges that are made in the U.S. Our eco-friendly printer inks and toners are 100% Satisfaction Guaranteed and patent-compliant. On our article yesterday, I introduced the ASUS U33Jc laptop also known as the Bamboo laptop, possessing "smoky brown bamboo exterior which exudes an organic quality reminiscent of designer furniture" as what the company had described it. But it seems the Bamboo-design concept wasn't the idea alone by ASUS because I found these cool Bamboo wireless keyboard and wireless optical mouse over the net. 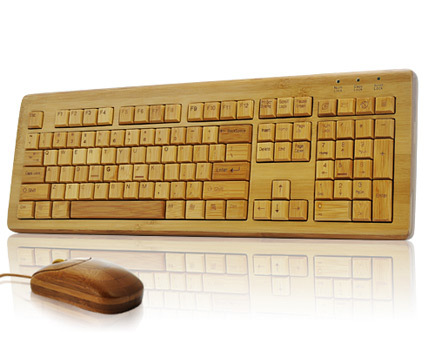 The Bamboo Keyboard/Mouse is a "beautiful hand crafted wireless keyboard and mouse" designed and produced by Pure Bamboo. It is actually created from the Moso Bamboo, is a kind of bamboo primarily used in manufacturing flooring, furniture and accessories. Bamboos have always been considered as an environment-friendly and highly renewable source of material, or alternative material that contributes to the wellness of our planet. The Bamboo Keyboard/Mouse is compatible with Windows 2000, ME, XP, Vista and Win7. 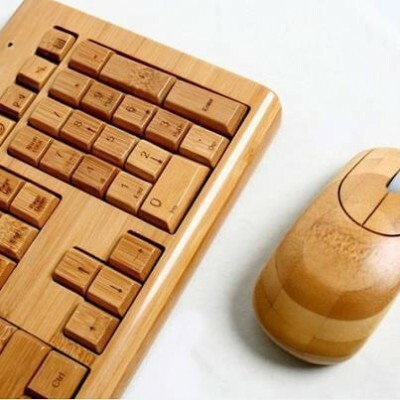 The Bamboo Mouse also features "a blue accent LED Scroll button light." The Bamboo Keyboard/Mouse was also described by its manufacturer Pure Living as "with the Real Bamboo Computer Keyboard & Mouse, you can stop hiding your technology in the spare room and integrate it into your living area." How amazing that these eco-friendly manufacturers are making the best ways possible to incorporate the "green concept" to the electronic devices we use everyday. Perhaps, this is just a fact that "technology and nature can go along together." TonerGreen is one of the eco-friendly manufacturers that aim to to be the leader in providing environmentally responsible printing solutions. Our primary product line includes U.S.-made remanufactured toner cartridges and remanufactured inkjet cartridges. Our products are not just ordinary recycled toner or recycled cartridges, and recycling is just a small part of the extensive remanufacturing process that our product undergoes at our in-house facility. Quality is strictly imposed every step of the remanufacturing process until our products are either picked up by customers or shipped to their address. 100% guaranteed. US Ecotoners - Tonergreen LLC. Powered by Blogger.